Early on in my time management study I became interested in discipline, how becoming disciplined can help us manage time. (It probably would help us manage just about everything else in our lives, but I only discuss time management at this blog.) What I didn't do when I was mulling over discipline was carefully define it. That is always a mistake in my experience. Discipline, as it turns out, involves training and maintaining behavior through control. That is a disturbing idea if you're applying it to others. Personally, I love it when applying it to myself. I love the whole idea of training. I'm shakier on the control part, as in self-control, but, hey, that's something I can train for, right? 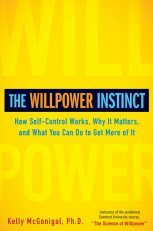 Which brings us to The Willpower Instinct: How Self-control Works, Why It Matters, and What You Can Do To Get More Of It by Kelly McGonigal. I mentioned McGonigal's name so frequently in the Situational Time Management Workshop I led earlier this month that I finally suggested we could use the name as the basis of a drinking game. The fact that I would even think of such a thing indicates that I need a whole lot more discipline and self-control. McGonigal never actually writes about time management. She writes about goals of all kinds, especially those involving changing behavior, and using willpower to achieve them. Well, managing time is both goal and behavior. There are a number of things she has to say that can apply to managing time, particularly for writers. People who are distracted have poor impulse control and are less likely to be able to stay on long-term goals. Many writers work out of their homes and have trouble maintaining a strong barrier between their professional and personal lives. Personal life distractions undermine our ability to stay on task. Thinking in terms of being "good" or "bad" relating to a goal undermines willpower. For instance, having been "good" and accomplishing a great deal this morning can be used as justification for being "bad" and not working this afternoon. We tend to think of the future as a wonderful place where we will accomplish great things. Thus, believing we'll feel more like working tomorrow or will get a lot done tomorrow justifies taking today off. Willpower failures and successes are contagious. A strong argument for writers' groups and group writing projects like NaNoWriMo. Giving in to the What-the-Hell-Effect when experiencing setbacks. We actually lose valuable work time when that happens. McGonigal even explains why meditating helps with self-control and attention, something I've been hearing about for years, though no one felt a need to explain why it would work. Meditating, it appears, develops the prefrontal cortex, the portion of the brain that deals with impulse control. Good impulse control helps people stay on task with goals. Find meditation difficult because your mind keeps wandering and you have to keep bringing it back to the breath? That's actually good, according to McGonigal. The effort to do that develops the brain just as physical effort develops muscles. This book has masses of material that can be applied to managing writing time, even though it's not about managing writing time at all. It's a marvelous aid for those of us who are interested in training for self-control. Man, do I still struggle with staying focused on my mantra or breath during meditation. But Deepak Chopra also says that's a good thing, and it's part of the process. I'm going to try to start a meditation project next month. Seeing the science behind it provides more motivation, at least for me. You are right. Discipline is not a one time impulse but a total life change that can help us reach the ultimate maximal levels of our potential.